Lord Brahma, Prahlada Maharaja and Richika Muni’s son Mahatapa had combinedly incarnated as Thakura Haridasa. Srila Haridasa Thakura is the namacharya of our sampradaya and is an eternal associate of Lord Gauranga.Srila Haridasa had accompanied the Lord in most of His magnanimous pastimes. He was an empowered incarnation of the Supreme Lord who had appeared just to set an example for all of us to follow. He had delivered innumerable suffering souls by bestowing upon them the nectar of the holy name. Though being born in a family of Muslims, Haridasa Thakura widely propagated that the chanting of Krishna’s holy names to be the Supreme spiritual practice, and preached how the Lord and His holy names are actually non-different.Thakura Haridasa teaches us, that the holy names of Krishna are actually non-sectarian and that God is one though we might call upon Him by different names. The relationship between the Lord (supersoul) and the jiva(soul) is eternal and chanting of the ‘Hare Krishna Mahamantra’ is the most effective means to evoke and revive this eternal relationship, especially in this age of Kali.The Thakura used to chant Krishna’s holy names, 300000 times a day, a practice he continued till the very end of his manifested pastimes. 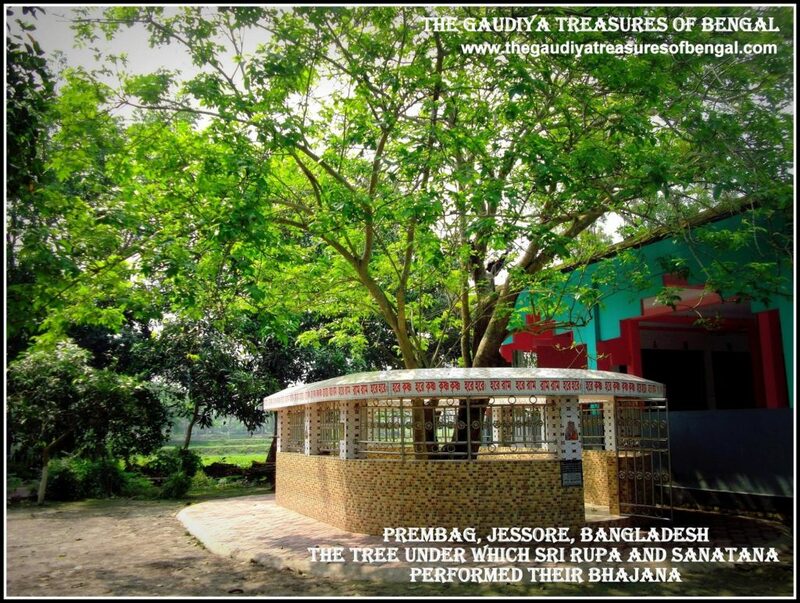 ‘The Gaudiya Treasures of Bengal’ recently visited the exalted spiritual site of Prembag, where Sri Rupa and Sanatana Goswamis used to once perform their bhajana. The sacred tree under which the two brothers rested and meditated continues to exist even today. This holy place is situated within the district of Jessore, in Bangladesh. Jessore is an exceedingly old place ,vibrant with rich cultural history.It once belonged to the ancient kingdom of King Janapada. In the 15th century, Jessore was part of the kingdom of King Pratapaditya. Sri Kavi Karnapura reveals in Gaura Ganoddesha Dipika that Sri Rupa Goswami was none other than the incarnation of Sri Rupa Manjari, one of the chief assistants of Lalita Sakhi (one of the eight principal Gopis of Vrindavana). Sri Sanatana Goswami was the combined incarnation of Rati Manjari,Lavanga Manjari and Sanatana Kumara.Sri Jiva Goswami has explained the genealogical history of Sri Rupa Goswami’s family. They were the descendants of Sarvagya Jagadguru, a great scholar of the Vedas.He was an expert in Yajurveda. Sri Sarvagya was a brahmin and also one of the kings of Karnataka in the 12th-century sakabda era. 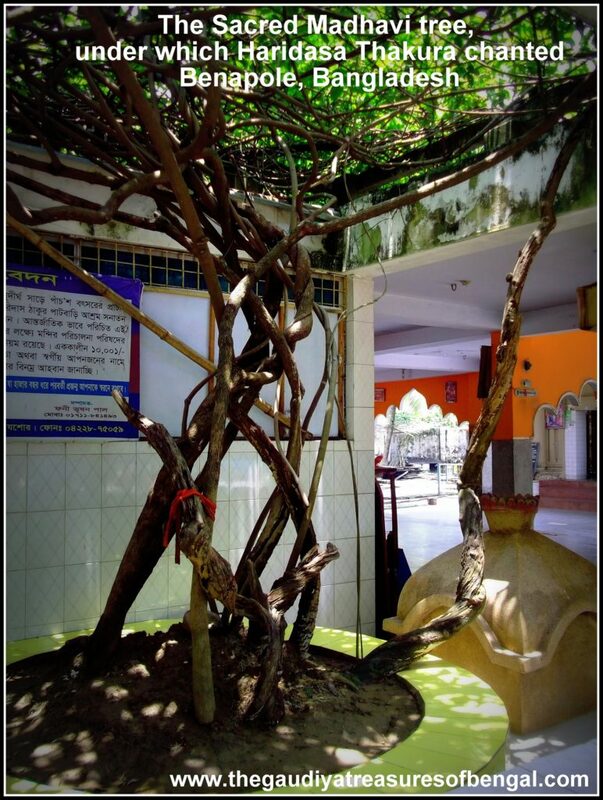 In his lineage appeared a great devotee named Kumar Deva who had settled in Jessore (Bangladesh). He got married to a very chaste lady named Revati devi. In course of time Kumar deva and Revati Devi gave birth to many sons. Most illustrious among them were Amara (came to be later known as Sanatana Goswami) ,Santosh(came to be later known as Rupa Goswami) and Vallabha (came to be later known as Anupama). It is believed that Sri Sanatana was born around 1488 AD while his younger brother Rupa, appeared in this world around 1493 AD. Sri Jiva Goswami was the son of Anupama.